Period: Up to 10 days (or half day equivalents) between 13th May - 22nd June 2019) including show day on Sunday 23rd June 2019. Location: WOW Workshop, Manchester (and community venues). Placement: Maker-designers placements with Manchester Day artists, making for a large-scale outdoor arts event. Suitable for new artists. ELEVATE is an artist development programme that supports North West artists to grow their skills, experience and network in outdoor arts through mentorships, placements and masterclasses. ELEVATE artists gain direct experience of making on Manchester Day, a large-scale creative parade and squares programme. With Walk the Plank, artists co-create with communities to create original work that attracts an audience of 70,000. Want to be part of making creative content for a major outdoor event? This is an opportunity to work alongside Manchester Day outdoor artists. Manchester Day is a unique experience, bringing together outdoor artists from across the region to work from one location (the WOW workshop) between May and June each year. This opportunity will give you a unique insight into working on a large-scale outdoor arts event. You will gain mentoring from practicing artists, learn new skills and techniques across a variety of materials, learn to produce on a fast-paced mass-scale production line, gain confidence working with unskilled community participants, and build your profile, portfolio and network. Applicants should be new & emerging artists, at the level of a recent arts graduate or under-graduate. But we are equally keen to hear from makers who did not follow the university route or career changers from all stages of life. Applicants must be available to work between May and June 2019 in Manchester. New & Emerging artists. Applicants should live in or around the North West of England and be available to work between May and June 2019 in Manchester. Although applications will be considered from outside the region if the applicant can support their own travel. Places are limited so final selection will be undertaken by a panel. 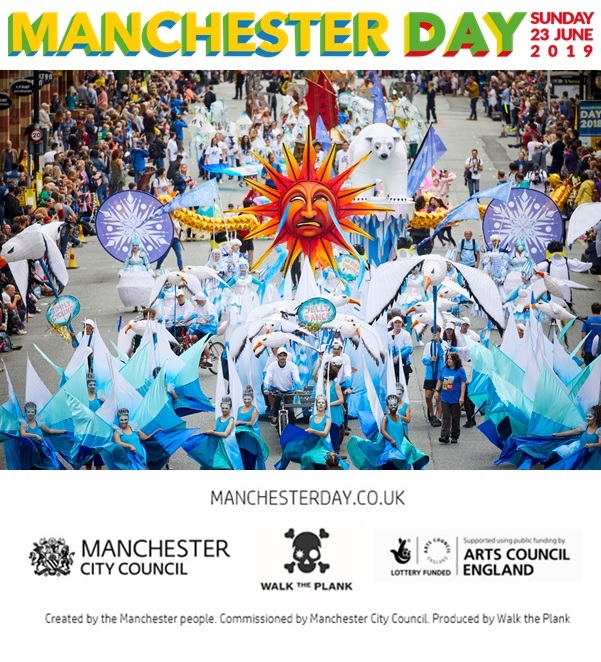 Selection will be based on how much the panel feels the candidate will benefit from the opportunity and what they will bring to Manchester Day. Walk the Plank and Manchester City Council are equal opportunity employers. Up to five unpaid placements, a daily allowance will be given of £5 for up to ten days. Step 1: Apply on CuratorSpace. Step 2: Complete the short application form. Step 3: Upload your artist CV and no more than 3 images of your art work to the application portal. The application deadline is: Tuesday 23rd April 2019. Short listed applicants will be invited to attend an informal gathering at Walk the Plank’s premises in Salford, so we can meet you and identify the best way to support you. Please pencil in Monday 29th April 2019, 6-8pm at Cobden Works in Salford. Applicants should live in or around the North West of England and be available to work between May and June 2019 in Manchester. Although applications will be considered from outside the region if the applicant can support their own travel.